Travelers may only intend traveled in Vietnam. However, there is no harm in helping them, is not it? 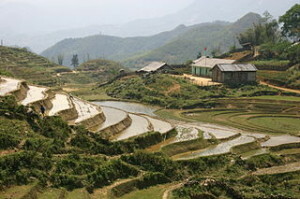 Sapa is located in the mountainous areas inhabited by minority ethnic groups. Most communities living around Sapa is poor and disadvantaged in terms of education. Sapa O’Chau is a nonprofit organization that helps children and communities in terms of education and social. This organization was founded by Tan Shu, a single mother of Ethnic Black H’mong. With the help of four Australian tourists, he opened a homestay and tour services. The gains returned to the community, for example by providing winter clothes for children or repairing damaged schools. After that, with the help of anthropologists from Norway open the classroom to teach reading to various groups, ranging from tour guides, street vendors, and others. Many of those who have never attended school at all. Sapa O’Chau accept volunteers at least 18 years old. English language classes opened to teach children and the public. Of course this is very important because it is the Sapa tourist sites with an increasing number of tourists. If you live in Sapa in a long time, they will help you find cheap accommodation. You can still help even just have some free time a day. Perhaps you have the skills to sing, dance, make crafts, and so on, that you can teach a child. Although small, your efforts will they receive the open. Sapa, tourists can find a number of recommendations including the lodging Sapa Luxury Hotel is located at 036 Fansipang, Casablanca Sapa Hotel located at 026 Dong Loi Street, and Green Valley International Hostel located in the Muong Hoa Road 0 45. As usual, handicraft souvenirs, can be obtained anywhere. However, Sapa is famous for handicrafts border. The thing to remember is that there are two types of borders, made from machine and the manual. If you want to buy handmade, you should buy directly from the manufacturer, while the border by machines are easily available in the stores on the main street located. Community market selling clothes, blankets with colorful designs that are characteristic of certain ethnic minorities in Sapa. If you intend to purchase this item, be careful when washing. This fabric dye usually fade. One way around that by soaking in cold water with salt. Before it is stored in a backpack, it should be wrapped in plastic cloth so as not to tarnish your other clothes. On the main road of Pho Cau May there are many restaurants that sell Italian cuisine, Vietnam, and India. Although travelers better to try local cuisine. Some recommendations such as eating places that sell Baguette Rose Garden and other bread that they make themselves, Little Sapa which sells typical Vietnamese food with some international menu, Bombay Indian serving typical north Indian food with a variety of vegetarian meals. In the market, you can also choose a variety of foods such as typical Vietnamese pho, noodles, fried rice, and so on. Great hotel in Sapa accept credit card payments network Mastercard, Visa, and travelers checks. International ATM networks are also available on the main road. You can also exchange money in a few dollars to Dong exchange point. Not all ethnic groups in Sapa open to the presence of foreign travelers. If you want take a pictures somebody, ask permission first politely. They may not be able to speak the English language support, but they certainly understand body language. If they refuse, keep smiling and go. Due to unpredictable weather, you should always provide a raincoat. Wear comfortable footwear to walk away with the steep terrain. Some choose boots for slippery roads and muddy. Maybe shoes are also suitable for mountain hiking to remote villages. Mountain sandals may only comfortable to wear in the city, because the weather is cold and you need a protective foot perfect. Although the price may be more expensive, it helps you buy embroidery fabric of the local community. Most of these ethnic groups and the poor the money they receive from tourists is very meaningful.